Any number of US airlines are in the midst of, or have recently completed, reconfigurations to increase seating density on their aircraft in an effort to drive additional revenue at a relatively low cost. As capacity creeps up in the domestic market place, airlines often reference their aircraft densification programmes as efficient capacity expansion. Three US airlines viewed as some of the most consumer friendly – JetBlue, Alaska and Southwest – have all opted to add seats to their respective narrowbody fleets. Those airlines walk the fine line of adopting strategies to bolster revenue while ensuring that passenger goodwill remains intact. Few consumers enjoy less legroom. The revenue potential of densifying aircraft for most airlines is too beneficial to pass up, reflecting the balance of appeasing investors and working to create a still comfortable travelling experience. It is a scenario whose prevalence will grow as both passengers and shareholders become more vocal in their demands. In late 2014 JetBlue revealed plans to densify its 150-seat Airbus A320s. At 34in pitch, the A320s operated by the airline offer the most generous space in a US economy cabin. The airline’s new non-transcon A321s feature 33in pitch in the coach cabin. JetBlue is adding 15 seats to the A320, which remains the backbone of the airline’s fleet. The retrofit is scheduled to begin in 3Q2016, and is forecasted to take two years to complete. Once the project is finished, the A320s will feature 33in pitch, which by JetBlue’s calculations, would remain the highest in the industry, slightly above the 32.6in seat pitch featured in Virgin America’s economy cabin. Orders include those placed directly by the operator and by lessors assigned to the operator, from 1-Oct-2015 onwards. JetBlue has estimated that the seat densification effort should generate USD100 million in incremental operating income by 2019. 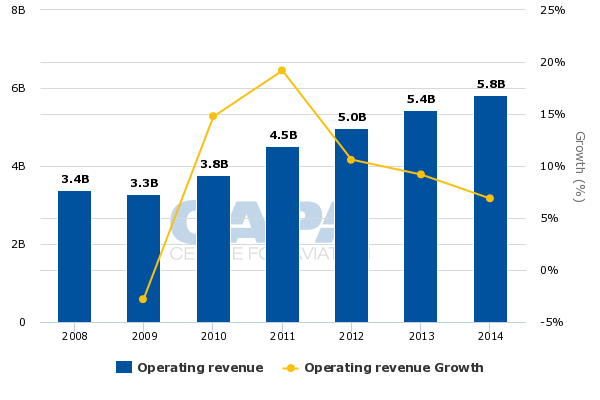 For a company that generated USD5.6 billion in operating revenue in 2014, and is looking for new revenue sources, adding seats while preserving its status as the airline with the most generous seat pitch seems like a logical evolution. Prior to its decision to add seats to its narrowbody aircraft, JetBlue had faced prodding from investors to densify its aircraft in order to shore up revenue. It is one of the more clear cut examples that US airlines face in balancing shareholder demands and sustaining positive passenger sentiment. JetBlue has largely excelled at the latter throughout its 15 year history. But it hasn’t generated the same level of returns as other growth airlines during the last few years, as investors became more demanding. The market has taken some notice of JetBlue’s efforts to bolster revenue (and its unit revenue performance during 2015) - although on 30-Sep-2015 JeBlue’s USD25.77 share price was lower than Spirit’s price of USD47.30, JetBlue’s P/E ratios were 19.03 compared with 12.73 for Spirit. JetBlue’s market capitalisation of USD8 billion was also higher than Spirit’s USD3 billion. Alaska Air Group in 2012 opted to reconfigure its Boeing 737-800/900 narrrowbodies with more seats. It added six seats to the -800 models and nine to the -900 variant for a total of 163 seats in the -800s (16 in first and 147 in economy) and 181 on the -900s (16 first and 165 in the main cabin). Similar to JetBlue, Alaska needed to tread carefully with the seat densification, and it noted once the reconfigurations were complete, it would offer 31in to 32in of pitch and 3in of seat decline. Alaska completed the project in late 2014, and in early 2015 stated the seat retrofit should provide an incremental benefit of USD25 million for 2015 and a total run rate of roughly USD50 million annually. 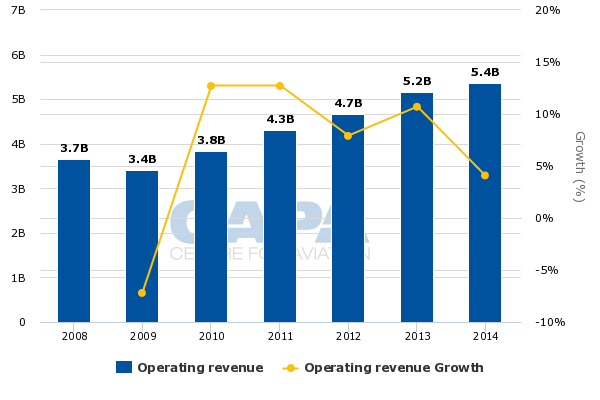 Alaska’s operating revenue was USD5.4 billion in 2014, so the incremental revenue obviously helps as the airline works to explain that its projected 10% capacity growth in 2015 is margin accretive. Previously, Alaska has attributed 3ppt of the capacity increase to aircraft upgauge, which includes the densified aircraft and the delivery of higher gauge Boeing 737-900ERs with 181 seats (16 in first, 165 in economy). Alaska has calculated that the trip revenue on each aircraft type that was retrofitted increases by 3% while the cost of the trip only rises 1%, which obviously is a net benefit to the company’s bottom line. Alaska has not faced the same pressure from investors as JetBlue, given its status as investment grade and its years-long streak of profitability. Although its USD79.45 share price (as of 30-Sep-2015) was higher than JetBlue and Southwest’s share price of USD38.04, Alaska’s P/E multiple of 14.48 is lower than JetBlue and Southwest, which has a P/E multiple of 16.46. Alaska’s market capitalisation is USD10 billion compared with USD25 billion for Southwest. Although gains in incremental revenue are driving most of the densification efforts at most airlines, the efforts also demonstrate a commitment to shareholders to find ways to sustain the profitability streak the US industry is currently enjoying. Southwest began its aircraft densification and upgauge projects in 2012 when it tabled plans to increase seat density on its Boeing 737-700s from 137 to 143, which now feature 31in of pitch. The airline undertook the “Evolve” reconfigurations as its was taking delivery of higher gauge Boeing 737-800s with 175 seats that have pitch of 32in to 33in. 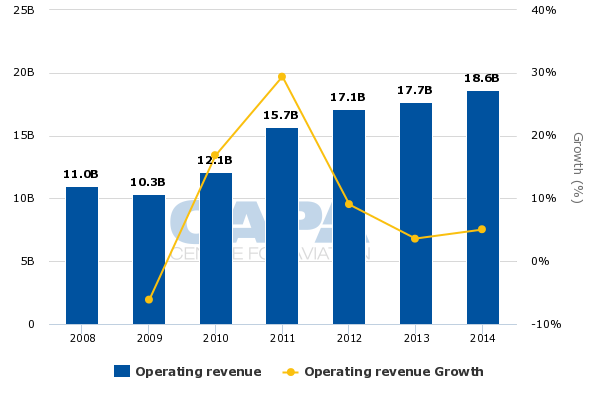 Southwest spent roughly USD60 million retrofitting the -700s, and in 2Q2013 the airline estimated that the fleet retrofit along with the commencement of -800 deliveries generated USD89 million in incremental revenue for that quarter. At that time Southwest estimated a USD300 million EBIT improvement from the fleet modernisation that included the -700 reconfigurations and the higher gauge -800s. In mid-2015 Southwest outlined plans to install a new type of seat on 737-800 deliveries beginning in mid-2016 and on its upcoming 737 Max jets. The airline explained it was giving passengers what they asked for, more space. The Chicago Business Journal highlighted that the Evolve seats on the -700s and existing -800s were problematic for business travellers on flights more than two to three hours. 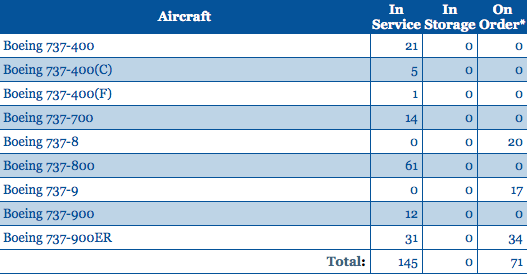 Southwest’s stage length has been steadily increasing, growing 4.3% during 1H2015. The airline stated that a raised rear beam and curve in the lower area allow for more shin and leg clearance, and shrinking the size of the armrest allows for an increased seat width from 17.1in to 17.8in. There has been no mention of retrofitting existing aircraft with the new seats, which would obviously be a costly initiative. But passenger discomfort on the Evolve seating shows that challenges remain in balancing the customer experience with revenue maximisation. Is the gap between investor demand and positive passenger sentiment growing wider? Aircraft densification is a trend that has swept most US airlines regardless of their business model type. As JetBlue, Alaska and Southwest demonstrate, even the most high regarded airlines by customers cannot escape the need to drive revenue in order to sustain profits and returns that investors have now come to expect on a regular basis. JetBlue is the next airline to face the delicate balance of trying to preserve passenger comfort (albeit with somewhat less space) while showing investors it is taking the necessary steps to bolster its revenue. For most US airlines, their two most vocal constituents seem to be at opposite ends of the spectrum – and the gap appears to only be growing wider.